If you heard a track of two of The Hot Sprockets music, and were then asked to stick a pin in a map identifying where they come from, you’d probably stick the point somewhere on the fringes of a Texan city, a spot with plenty of raucous rock influences, but a distinct country twang known for effortless, whisky-bar showmanship. The five-piece actually hail from different corners of Dublin, having spent much of their performance-loving career entertaining their own niche with a thunderous live show. They rumble between gigs in an ageing Nissan Micra and very much live for their music. Newly released third-album ‘Dream Mover’ is the latest stage in a slow-paced and precisely crafted evolution. “It’s a bit more psychedelic, the production is a real step up from [second album] ‘Brother Nature’, and the song writing’s better than the last record. We feel like we’re really evolving as songwriters,” multi-instrumentalist Frankie Kelly tells us of the new release. 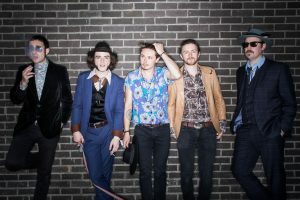 The Hot Sprockets have long linked heavily with Wicklow music Knockanstockan, and point to the non-mainstream style of the attendees being a good fit for their own music. They’d love to move to full-time music, however, and while they don’t really expect all that much mainstream success, it would have significant impacts were it to come along. “Years ago, Tim used to work in a vintage clothing store, so he just got sweet clothes for free,” Kelly adds. “We just kind of got mad into the clothes together, and kept doing it.” The result can feel like an authentic shift in time and place: The Hot Sprockets wardrobe would be genuinely hard to track down in Dublin, and sits perfectly alongside their sound. 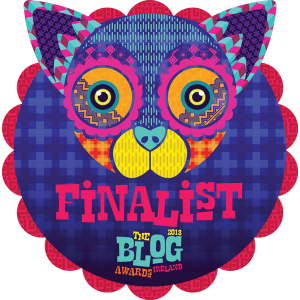 The band have also been involved in the Repeal the 8th (abortion access in Ireland) referendum campaign, putting together a cover of Wyvern Lingo after prompting from Dave Judge, who runs Abner Browns and The Underground venue. 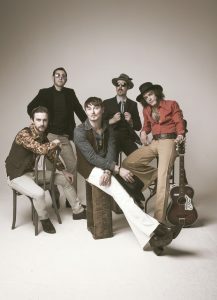 For now, though, The Hot Sprockets will mainly be pleasing the local crowd, one they profess a real love for: those whose hearts screams for the blues, and those who simply can’t miss something so effortlessly, raucously entertaining. The Hot Sprockets’ latest ‘Dream Mover’ is out now.